Most heart-rate monitors — the ones that actually work — involve chest straps and clunky armbands or wristwatches to get the job done. Liz Dickinson thinks heart rate can be accurately measured with a sleeker, strap-free device. Dickinson, the creator of the MIO watch, has partnered with Philips Electronics to create a new watch called the Alpha. It’s a continuous-heart-rate monitor that can be worn on the wrist, doesn’t involve a chest strap and, in testing, has measured an accurate EKG at performance speeds of up to 12 miles per hour. “The goal with this tech was to eliminate the muscle noise,” Dickinson said in an interview. “The wrist moves so much and there’s so much ambient noise that in the past it’s been hard to get just the heart rate.” She said that paying a visit to the Philips company in the Netherlands two years ago convinced her this device could be done. The Alpha has a simple white-framed face and comes with a breathable black strap. 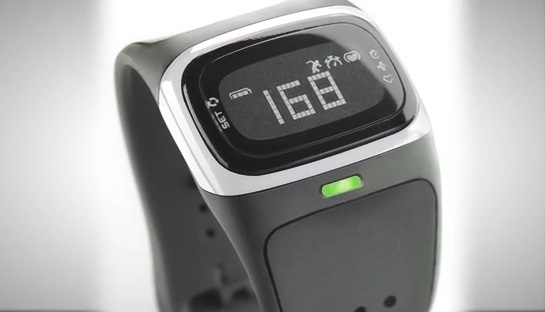 It tells time, has a timer, gives both visual and audio alerts when the wearer moves in and out of heart-rate zones, and offers a “last run” stats review. On June 25, Dickinson launched a Kickstarter campaign for the watch. The Alpha raised more than $113,000 in about a week, surpassing its $100,000 Kickstarter goal. The device is set to ship in November, and will cost $250. While wearable fitness gadgets that measure activity (but not heart rate) have recently become all the rage, some proponents of fitness tech still believe in the metric of thump-thump-thump to measure exertion levels. The Alpha is clearly marketed at people who compete or take their fitness seriously. Alpha’s biggest competition might come from the Basis band, which was shown off at this year’s Consumer Electronics Show (but has yet to hit the market). The Basis B1 is a cool-looking wristband that uses skin sensors to monitor heart rate, and is priced at $199.